I never liked eating cheesecakes, but I always liked making them. From traditional New York Cheesecakes to Coffee Chocolate Chip Cookie Dough ones, there was something about popping open that springform pan that somehow gave me joy. But now I found a recipe (adapted from Grace Parisi) that is so easy and so tasty that I actually like to eat these cheesecakes too. I hope everyone else enjoys these as much as I do since I will be making them for BAKEFEST DXB. Hope to see everyone on November 26!! 1. Preheat oven to 350 degrees F. Line a standard 12 cup muffin tin with foil baking cups and spray with vegetable oil spray. 2. In a food processor, finely crush all the biscuits. Add butter and keep processing until mixed. Spoon the mixture into the 12 cups and press with the bottom of a glass to compact the crumbs. Bake for 5 minutes or until set. Leave oven on. 3. In a medium bowl using a handheld mixer, beat the cream cheese with the sugar at medium speed until smooth. Beat in the crème fraiche, the eggs, and the vanilla. Beat until smooth. 4. Pour cheesecake batter into prepared muffin cups and fill about ¾ full. Bake 10-15 minutes or until centers are slightly jiggly. Remove from oven and cool. Transfer to fridge and chill. 5. When ready to serve, remove foil paper and transfer to plate. Top with raspberry jam. 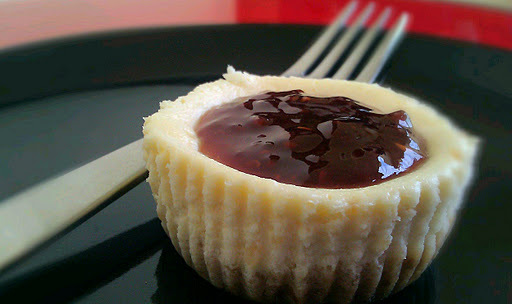 This entry was posted in Desserts, Pantry Diva Events, Vegetarian and tagged Desserts, Mini Cheesecakes with Jam by thepantrydiva. Bookmark the permalink. This looks tastee and doable! I never tried baking a cheese cake – it just seemed too difficult, but I do love to eat them!How many Americans, except those who lived overseas, do you think will know what a McVities Biscuit is?! I never did develop a taste for them – I still prefer Graham Crackers – Keebler please!